Item13(a) - Bunbury Townsite showing Wellington, Prinsep, Wittenoom and Victoria Streets by Campbell Carey, 1868. Item13(b) - Part of Bunbury Townsite - Stirling and James Streets, showing Lots P5 to P8 inclusive. Item13(c) - Part of Bunbury Townsite - a rough sketch showing alterations in Victoria Street. Lots 9, 10 and 12. Item13(d) - Part of Bunbury Townsite showing Stephen, Stirling, Arthur and James Streets (Lots 282 to 293 inclusive). Scale: 3 chains to an inch. 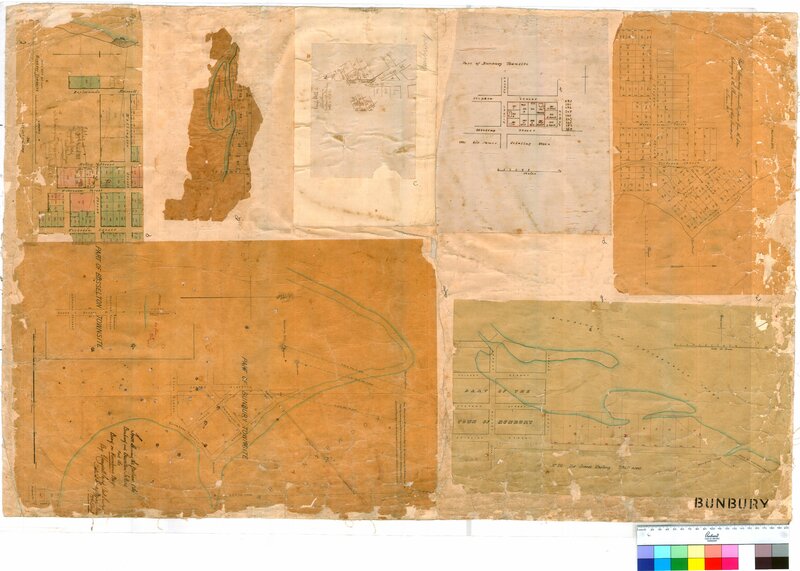 Item13(e) - Part of Bunbury Townsite from plan belonging to Chairman of Town Trust, June 1857. Item13(f) - Part of Bunbury and Busselton Townsite showing position of jetties and buoy in Koombana Bay by Campbell Carey, 12 August 1868[?] Scale: 3 chains to an inch. Item 13(b) - Part of Bunbury Townsite - Stirling and James Streets, showing Lots P5 to P8 inclusive. Confirm Item Request: Part of Bunbury Townsite - Stirling and James Streets, showing Lots P5 to P8 inclusive.